WHEN JESUS RETURNEDfrom the Feast of the Passover at Jerusalem, his disciples were with him, you remember. But after coming into Galilee Jesus went to his home in Nazareth and the disciples returned to their homes in Capernaum. After the proud men of Nazareth tried to kill Jesus, he left their city and went to live in Capernaum, too. Here he taught in the synagog on the Sabbath-days, and the people of Capernaum were glad to listen to his words. He did not teach them as did their usual Jewish teachers, repeating the same words again and again each time he spoke, but always his words sounded new, and just as if God were speaking to the people. Jesus was not pleased to have a spirit of Satan speak to him like this. So he commanded the bad spirit to come out of the man. And the spirit threw the poor man on the floor before all the people, tearing him and crying with a wicked cry. But at Jesus’ command the bad spirit had to leave the man; for Jesus has power over all the power of Satan, to cast out the evil spirits that come to dwell in people. Jesus had gone with his disciples from the synagog to the home of Simon and Andrew. When they arrived they heard that Simon’s mother-in-law was lying sick with fever. So they told Jesus about her, and brought him into the room where she lay suffering. Finally the last group of happy friends departed from the doorstep, and Jesus lay down to sleep in Simon’s house. How very tired he must have been! But after sleeping only a few hours he rose up quietly and left the city. He sought for a place where he might be all alone to talk with his heavenly Father, for often he prayed earnestly to God for strength and help to do the great work that he had to do. When daylight broke, people began coming again to Simon’s home, asking for Jesus. But Jesus was not there. Simon and his friends began to search for Jesus, and they found him at his place of prayer. They told him about the anxious seekers who had come early to find him again, and Jesus said, “I must preach the kingdom of God in other cities also, for I am sent to do this great work.” So the disciples went with him to visit other cities of Galilee, and Jesus taught in the synagogs of those cities and cast out evil spirits, as he had done in Capernaum. And many people believed in him. After some time he returned again to Capernaum, and his disciples went back to their work as fishermen. But Jesus continued to teach the people who came to hear his words. 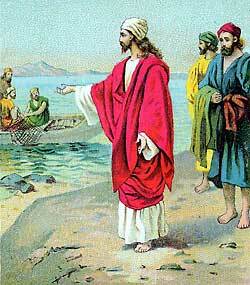 One day he went out to the seaside where his disciples were at work, washing their nets. Many people saw him leave the city, and they followed. Soon a great crowd gathered on the shore, eager to hear him preach. So Jesus asked permission to sit in Simon’s ship and speak to the people who stood on the shore. And Simon understood from Jesus’ words that he must leave his fishing business and follow the Master everywhere he went. So when the fishers made their way to the shore they forsook their ships and walked with Jesus from one city to another, helping him and learning daily more and more about the kingdom of God.